Jeff Brown, Principal, Rothelowman & Jonothan Cowle, Associate Principal, Rothelowman. 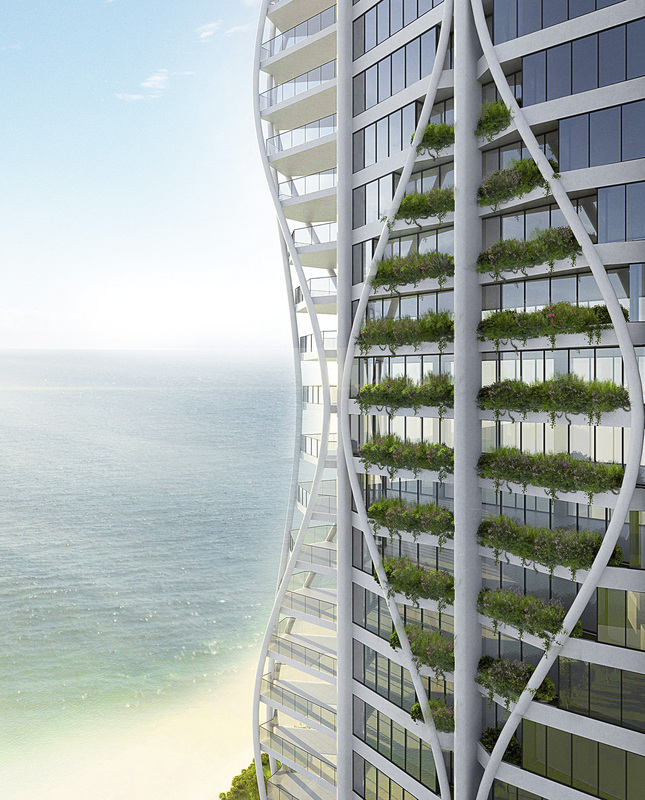 Previously unbuildable buildings have become a reality thanks to advances in parametric design. As any architect will attest, attempting to make a pencil thin tower stand upon a small parcel of land in the middle of a city is no small feat. Nor is the humane architecture that’s needed to create highly liveable places where people aspire to reside. Yet as land becomes scarcer in our cities, developers continue to search for ways to innovatively accommodate growing communities within easy reach of existing infrastructure. 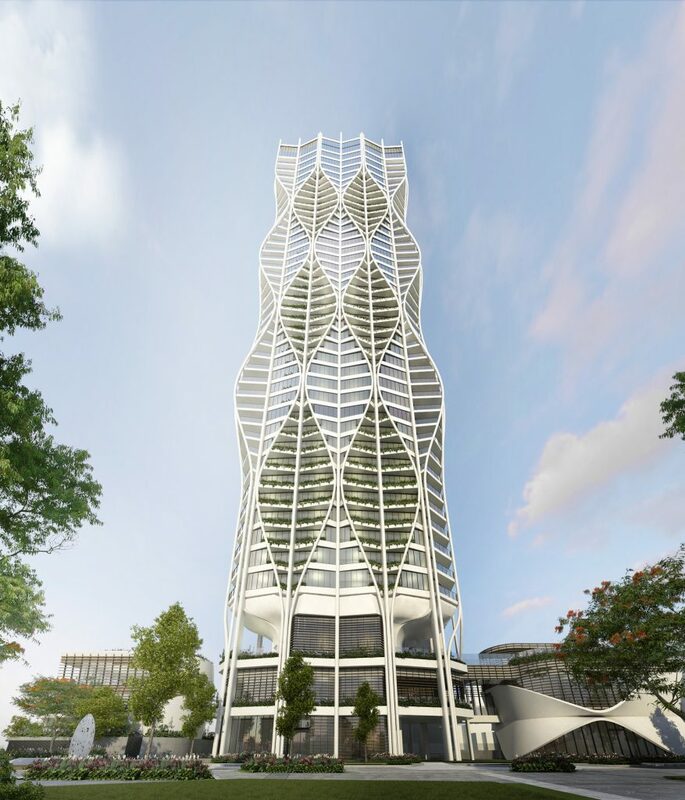 They look to their architects for a range of intelligent and precision-based approaches that will enable them to make these buildings as well designed as they can possibly be. Historically expensive to create and commercialise, slender towers must achieve tight feasibility width-to-height ratios in excess of 1:12 despite highly complex wind loadings, planning, engineering and site specific matters; often enough to put off those without the deepest pockets. Two such towers are underway in Queensland, where our team is working on game changing designs in Surfers Paradise and Brisbane. Aerodynamic Curved Form Podium Design. Rothelowman. 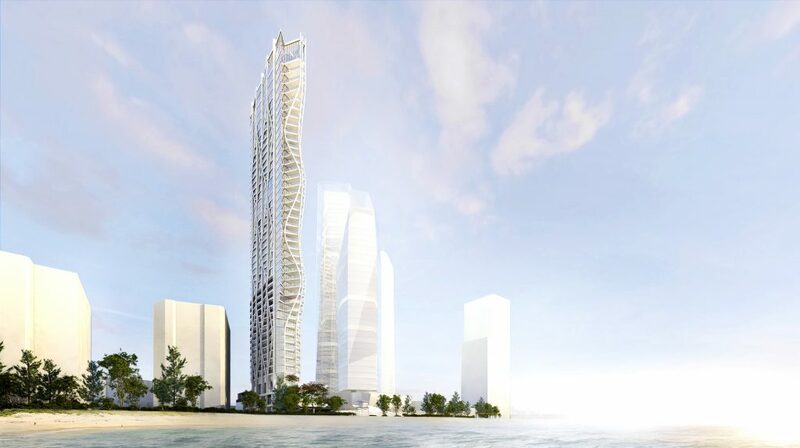 The first, a picturesque but elementally exposed waterfront site in Wharf Rd, Surfers Paradise involves the design of a 165m, 12m wide premium residential project at a ratio of 1:13. 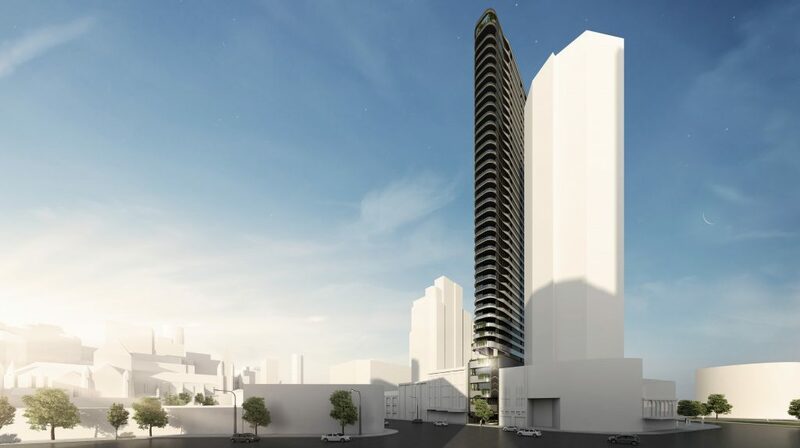 The second, in Brisbane’s Ann St, is a proposed 147m high, 9m wide apartment project that, at a ratio of 1:16, would become one of the world’s thinnest buildings. In contrast to Wharf Rd, the Ann St site is nestled behind an existing tower, requiring an approach that is more complementary to the wind movement of the neighbouring buildings. This has resulted in a more aerodynamic curved form that allows existing wind movement and turbulence to be mediated in conjunction with other taller structures. 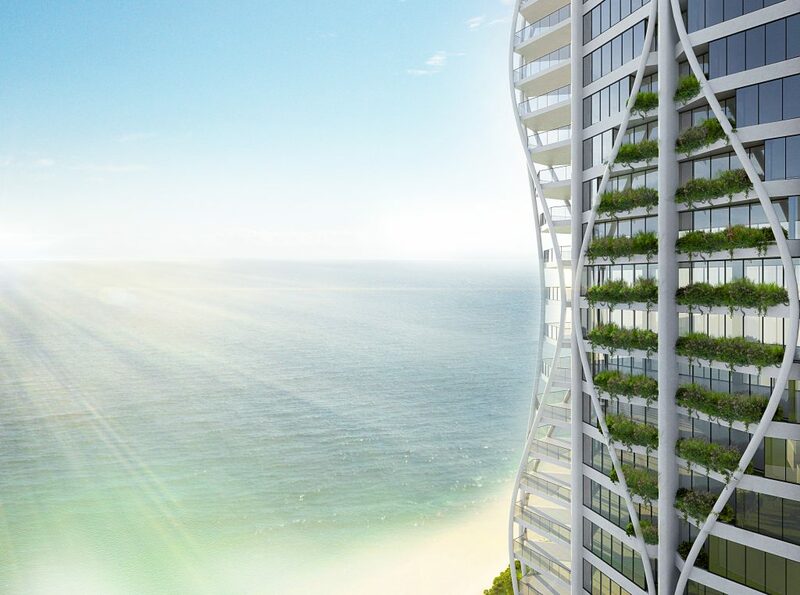 When it comes to designing these slender towers, there are no general rules or principals, other than to be specific to the site and local environmental and planning restraints. What matters most is the design process itself, open collaboration, understanding of science and parametrics, and a willingness to push the design envelope. With a brief to create whole-floor subtropical beach houses in the sky for the Wharf Rd project, our team set about making viable a site that might previously have been deemed too tricky to develop. Assembling a team of market-leading partners and consultants, we relied on science to create significant structural efficiencies that were then digitally tested and analysed in detail. We then humanised the design to create a highly resolved building that is feasible, liveable and beautiful. 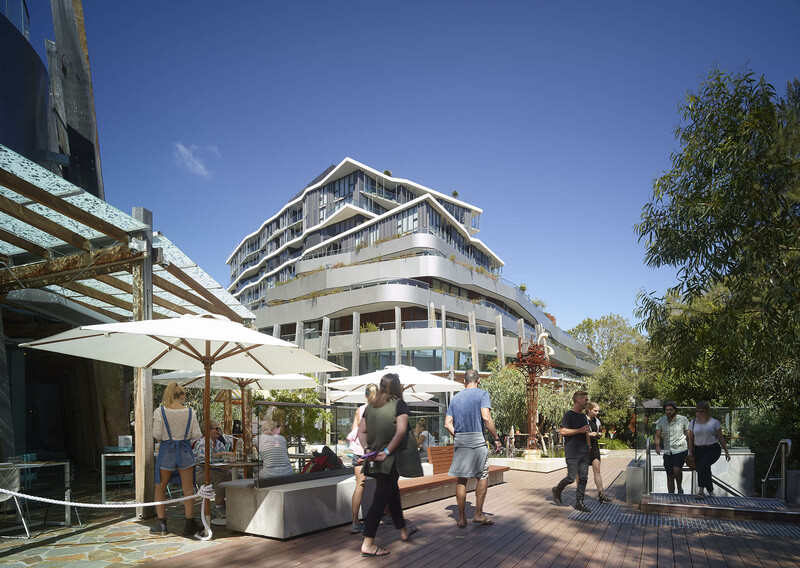 From a parametric design perspective, the Wharf Rd process involved capitalising on an articulation zone within the planning scheme that enabled us to move what would have been a traditional inboard structure to the building’s exterior. In creating this exoskeleton, we were able to alter the tower’s structural dimensions to achieve a commercially viable ratio of 1:13. In other words, we kept the same floor space and tower height but decreased the width-to-height ratio to achieve a more stable building. The exoskeleton design meant we now had the ability to cross-brace the building externally via a diagrid, rather than being reliant on sheer walls and strong boxes for stability. This enabled us to open up the facade and create a truly three-dimensional building, with windows on all sides and enough asymmetries to mitigate the prevailing winds. Importantly, we were able to provide highly articulated beach houses with stunning views and wonderful cross ventilation while ensuring the developer received a viable design that exceeded their commercial expectations by delivering an extra two floors. Whole-Floor Subtropical Beach Houses in the Sky. Rothelowman. 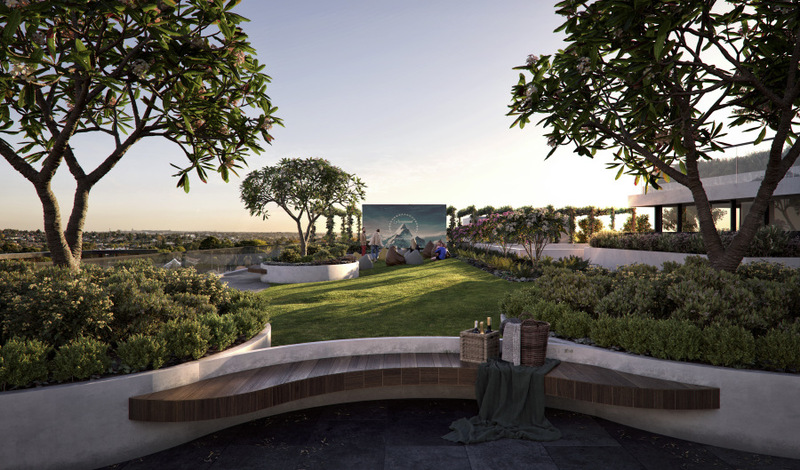 It is our view that projects such as this are a precursor to what may come in Australian cities, where ownership of land is increasingly fractured, consolidation of land difficult to achieve, and populations rapidly growing. When a site seems impossibly narrow, any building designed for the space will be so complex that nothing can be left to chance. These projects require the highest level of design input and management, from the facades to the car parks. The success of these slender towers is highly dependent on architects’ ability to assemble teams that are willing to think outside the square and fine-tune each parameter along the way.